In the cult television Valhalla, viewers have encountered several lost or wayward space travelers: human men and women isolated in the void of outer space, and seeking a new home (Space: 1999, Lost in Space), a way back to Earth (Star Trek: Voyager, SGU) or even a mere respite from pursuit (Battlestar Galactica). In virtually every well-known TV tale of “lost” space travelers, however, the human community struggling to survive has been forced to contend not just with externals dangers such as strange space phenomena or hostile aliens…but with threats from within their very group. These internal dangers – these treacherous characters -- are perhaps the trickiest to manage, and these menaces often cause tremendous discontent and strife. So without further introduction, here are the five characters you’d least like to be lost in space with. 5. 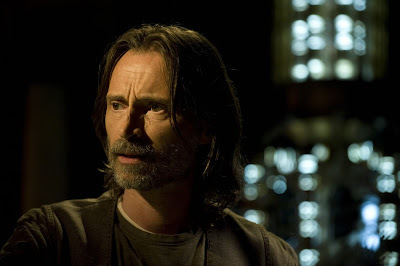 Dr. Nicholas Rush (Robert Carlyle) on SGU (2009 – 2011). Admittedly, Dr. Rush is not flat-out evil, like at least a few of the names you’ll note on this list, but he’s certainly…difficult. A genius and a dedicated scientist, Dr. Rush finds himself trapped aboard the Ancient starship Destiny, a vessel flying out of control and headed beyond the confines of our galaxy. Although we learn in the episode “Human” about the tragic death of Rush’s wife, Gloria (Louise Lombard), that personal background detail hardly excuses Rush’s secrecy, his arrogance, or his schemes to see life on Destiny unfold by his agenda. Early on in the first season, Rush frames the ship’s leader, Colonel Young (Louis Ferrara) for murder, so that he can continue to study Ancient technology unimpeded. After Young exiles Rush on a desolate planet, Rush manages a return (thanks to a little alien abduction…) and returns to Destiny. Once there, he agrees to cooperate fully with Young for the well-being of the crew, but in the very next episode, sets about trapping Young aboard a shuttle, and seizing control of the Destiny for a faction of civilians. In short, Rush is a valuable asset in terms of his intelligence and knowledge, but absolutely unreliable in terms of loyalty or team-work. 4. 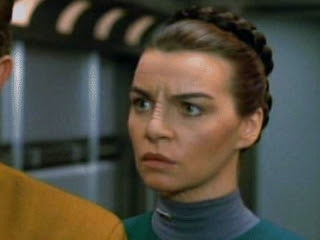 Seska (Martha Hackett) on Star Trek: Voyager (1995 – 2001). Seska is a member of Commander Chakotay’s (Rorbert Beltran) Maquis crew when she joins Voyager in the Delta Quadrant in the series pilot “Caretaker.” Introduced in the second episode, “Parallax,” Seska quickly proves that she isn’t exactly Starfleet timbre. She constantly second-guesses attempts to integrate the two disparate crews, and deliberately goes against Captain Janeway’s orders of non-interference in the episode “Prime Factors,” opting to steal alien technology that could provide a short-cut home. Of course, the kicker with Seska is that she is incredibly deceptive. She is not the Bajoran she appears to be, but rather a Cardassian spy! When Janeway’s command style proves to her intense disliking, Seska reveals her true colors and begins secretly working with a villainous Kazon sect that hopes to seize Voyager. Finally -- making her the intergalactic equivalent of Fatal Attraction’s Alex Forrest -- Seska impregnates herself with Chakotay’s DNA and then uses Chakotay’s child as bait to entrap Chakotay and the Voyager crew. 3. Commissioner Simmonds (Roy Dotrice) on Space: 1999 (1975 – 1977). When the moon is blasted out of Earth’s orbit, Moonbase Alpha is manned by 311 dedicated scientists and astronauts. Plus, there’s one politician tagalong…Gerald Simmonds. In the first episode, “Breakaway,” Simmonds is revealed to be your typical political animal, a man who would do and say anything to avoid making a tough call, and at the same time maintain his position of power authority. He’s a weasel and a bureaucrat, one who would easily let Commander Koenig (Martin Landau) take the fall for a difficult decision. But in his second appearance in “Earthbound,” Commissioner Simmonds proves rather more malicious than his behavior in “Breakaway” suggests. When visiting aliens called Kaldorians arrive on Moonbase Alpha, Simmonds contrives to take any action necessary – including blackmail – to assure that he gets a seat (or stasis tube…)on their spacecraft, which is headed to Earth. Specifically, he threatens Alpha’s life support unit, and holds several technicians at gunpoint. 2. 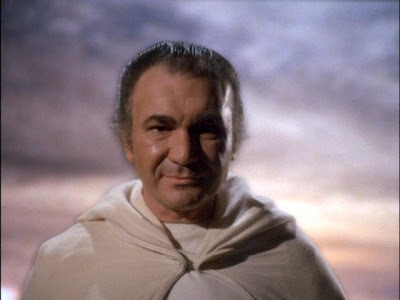 Count Baltar (John Colicos) on Battlestar Galactica (1978 – 1979). In the first episode of the original Glen Larson series, Baltar betrays the entire human race to the genocidal Cylons. He does it with a smile, which makes it worse. In a later episode, “War of the Gods,” Baltar is back. This time, he’s fearful of the Ship of Lights and visits Galactica to propose a universal truce. Instead, he is immediately imprisoned and taken to the Prison Barge, where he attempts escape (“Baltar’s Escape”). And finally, in “The Hand of God,” Baltar again navigates the narrow line between friend and foe, promising the Colonials critical information about the lay-out of a Cylon base-star if only they grant him his freedom and maroon him on a habitable planet. The problem with Baltar, of course, is that betraying and exterminating nine-tenths of the human race is an offense that’s tough to walk back from. But that doesn’t stop him from trying. Why propose a truce? Why propose teaming-up? No one can guess what really motivates Baltar, besides his own lust for power. 1. 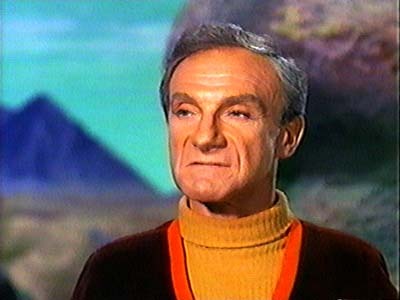 Dr. Zachary Smith (Jonathan Harris) on Lost in Space (1965 – 1968). If Dr. Smith is near, you have plenty to fear, to turn around a popular character catchphrase. This “reluctant stowaway” aboard the Jupiter 2 in Irwin Allen’s Lost in Space started out as a saboteur and villain, and then became – for three years – a constant irritant to the heroic Robinson family of space pioneers. Cowardly, manipulative, and insulting (especially to the robot), Smith managed to land himself and usually the Robinsons too into all kinds of trouble over the years. In “My Friend, Mr. Nobody,” he nearly killed a peaceful alien so as to possess a cache of diamonds. In “The Oasis,” Smith used-up the last of the family’s precious water…for a shower. Smith causes accidents (“Wish Upon a Star”), sabotages spacecraft (“The Raft), covets alien items (“The Magic Mirror”), requires constant rescue (“His Majesty Smith”), is transformed into a stalk of celery (“The Great Vegetable Rebellion”), and even attempts to sell the family robot as spare parts (“Junkyard in Space.”) In short, he makes life miserable for the Robinsons. It has often been suggested that Dr. Smith be shown the way to the nearest airlock on the Jupiter 2, and booted into space. It’s a testament to the Robinson family’s good-nature (and the family friendly atmosphere of the series…), that this never occurred. But Smith surely represents all the worst in humanity, from greed to treachery to disloyalty. It would be miserable to be lost in space with this guy. 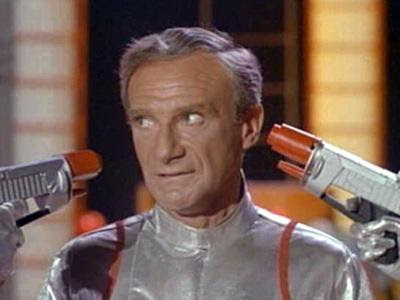 In fact, just imagine being lost in space with a crew consisting of Dr. Rush, Seska, Commissioner Simmonds, Baltar and Dr. Smith. Which of 'em would get kicked out the airlock first?